One artist is out to prove that cartoonist extraordinaire Charles Schulz earned his place among such greats as van Gogh and Picasso. In his lifetime, Charles M. Schulz rarely turned down interview requests. He found them “relaxing” and a welcome distraction from his day job, drawing the world’s most popular cartoon strip, Peanuts. He frequently mentioned to reporters that his parents had third-grade educations and that he himself never finished college. When Newsday's reporter Stan Isaacs asked if he saw cartooning as a art, Schulz responded, "Comic Strips aren't art; they never will be art. They are too transient. Art is something so good it speaks to succeeding generations. … Comic strips are not made to last; they are made to be funny today in the paper and thrown away." Artist odd couple: Despite coming from radically different backgrounds, Charles Schulz and Tom Everhart became friends in 1980 and stayed close until Schulz’s death in 2000. Today, Everhart makes large-scale paintings inspired by his late friend’s famous cartoon strip. Peanuts. Often the subtext of Everhart’s work says something very direct about the art of Schulz, including the seven-foot-tall paintings shown here, “Performance Art 1” (left) and “Performance Art 2” (right), both unfinished. In this series, Snoopy rises up on his kind legs, recalling the watershed moment in 1960 when “Snoopy becomes a true abstract character,” says Everhart. The put downs became such a signature part of Schulz interviews that one reporter, B. Eugene Griessman of the Atlanta Journal Constitution, called him out on it: "You say you are not very sophisticated at all. Why do you say that? Is it because you're modest or because it's true?" To which Schulz replied, "I really think it's true. In the first place, I don't really think I'm especially smart. … I don't regret not being highly sophisticated, but who even knows what it is? I don't even think about it. Fourteen years after his friend’s death, Everhart is still on the crusade to prove that not only did Schulz know exactly what he was doing but that he was an abstract master, on paper with the greats: van Gogh, Rothko, Pollock, even Picasso. He has made it his mission to dispel Schulz’s own carefully crafted image as the Midwestern simpleton who drew funny-looking kids. Everhart has given more than 75 public lectures, and his own paintings revolve around this central thesis: Charles Schulz was an artist, and he knew it. Here, Artful Living examines Everhart’s case. Artist Tom Everhart is on a mission to make the case that his friend Charles Schulz was a self-aware artist of the highest degree. Here’s an abbreviated version of his lecture. Exhibit A: Schulz left clues in his strip. Even as he professed himself unsophisticated in the press, Schulz was actually very well-read and closely followed art trends, says Everhart. Thomas Eakins and Vincent van Gogh are named in Peanuts, but some references are much slier. Case in point: Schulz knew and admired painter Phillip Guston and paid quite an homage to his famous closet light bulb (left) in a cartoon published shortly after Guston’s death in 1980. Exhibit B: He cultivated a form of line work that was revolutionary for its day. A line-work detail from Peanuts (left) and an untitled painting by American abstract expressionist Franz Kline (right). Everhart says that Schulz intensely followed the developments of the abstract expressionists in the early 1950’s, when his comic strip was just a few years old. 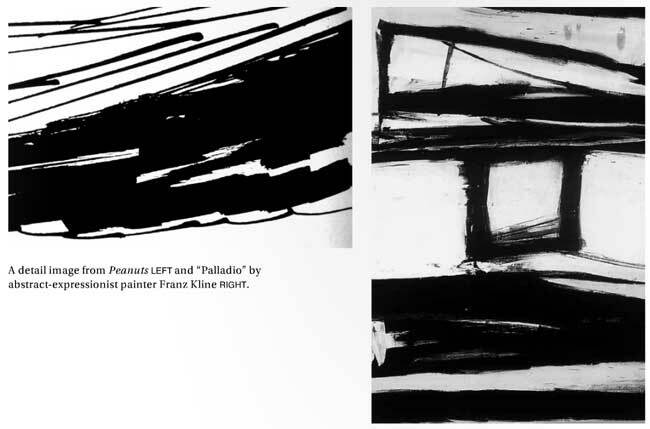 A detail image from Peanuts (left) and “Palladio” by abstract-expressionist painter Franz Kline (right). Charles Schulz was deeply influenced by the line work of Vincent van Gogh, the post-impressionist master (top left). A section of van Gogh’s painting “Marches de Pierres Dans le Jardin de l’Hospice.” The other three images are examples of Schulz’s line drawings, as printed in the Peanuts comic strip. Exhibit D: Schulz developed a distinctive wavy-line effect that added incredible visual interest. Exhibit E: Schulz believed the best line work incorporated lots of light. “His lines move from fat to thin and then from thin back to fat — almost like a stoplight flashing at you,” says Everhart. “The effect is one of dappled light. Exhibit F: Schulz was able to explain complex ideas, such as time and space. Says Everhart: “He told me once that every mark on a piece of paper plays with the surface. So in that way, each mark is noted by the eye individually and thus represents time.” In this way, Schulz’s Woodstock never says a word, but he speaks nonetheless. Exhibit G: Schulz toyed with the artistic feel of his strip to such a degree that the earliest panels are virtually unrecognizable as Peanuts. He used traditional perspective in the early 1950’s (right). Note the horizon line with the house and the trees in the distance. Exhibit H: Toward the end of his life, Schulz became a little more frank. From 1950 to 1960, Charles Schulz changed almost everything about his comic strip. As Schulz read more about the abstract expressionists, he realized his art needed to be distilled and clarified, that he needed to remove visual obstacles and create a stronger bond of intimacy between character and reader. In the mid-1950’s, Schulz began to eradicate traces of spatial depth from his strip. A Peanuts panel from the early 1950’s (left) and the panel printed in post -1960 (right). A detail shot from “interior with a Girl Drawing.” By Pablo Picasso (left) and a post-1960 drawing of Snoopy (right). Schulz had a favorite Picasso quote: “A face has two eyes, a nose and a mouth. You can put them where you want.” Like Picasso, Schulz abstracted his characters to such a degree that when they turned their heads, their eyes wouldn’t be in the same place (creating an exceptional challenge for the animators of the Peanuts TV specials and movies). Charlie Brown is never shown riding a tricycle, for example, as his arms and legs are too short. A real-life Charlie Brown would not be able to get his arms over his head. He stripped each character down to its most essential, expressive self. Charles Schulz helped the budding artist blossom. Tom Everhart was born on May 21, 1952 in Washington, D.C. His love for the arts began at a young age and led him to enroll in Yale University Art and Architecture Program. After graduating in 1976, Everhart found himself yearning for more. He continued to pursue his passion through a post-graduate program at the prestigious Musee de l’Orangerie in Paris. Everhart was introduced to Charles Schulz in 1980; the two quickly became close. Armed without much knowledge of cartooning, Everhart frequently blew up the cartoonist’s popular strips on a 25-foot wall in his studio. In this medium, Schulz’s pen-stroke spoke to him in a way the traditional comic strip could not. Schulz encouraged Everhart to explore the comic strip in his own work, but the artist was scared the world wouldn’t accept his radical Peanuts renditions. Then, in 1988 Everhart was diagnosed with and treated for stage 4 colon and liver cancer. As he lay in his hospital bed, surrounded by stacks of Schulz’s comic strips, light began to shine through the window, gently reflecting Peanuts images onto the wall. Whether it was the light or Everhart’s medicated state, he claims to have seen images of his future Schulz-inspired paints projected on the wall of his hospital room.